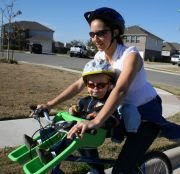 One day this week I almost rear-ended the car in front of me when I glimpsed a woman riding towards me on a bike with her toddler balanced on the handlebars. What kind of idiot would do that? About the time I almost locked up my brakes, I realized it was one of these new "kangaroo" bike child seat things that puts the kid up front. This one's an iBert but there several other manufacturers. I think this is another one of those products that only get bought for first-born kids.